I am not a good bowler, but the one day that I really needed a strike on a particular frame, I got it. It was the day that the chain bowling alley was offering a "lucky strike" pass good for free bowling from Labor Day through Halloween. All you had to do was wait to get one of the three colored pins in the hopper to show up in the front spot and then bowl a strike. That one frame with the colored pin in the right spot was one of only two strikes that I bowled in two games that day. Well, armed with free games, I headed over to the bowling alley in my spare (ha ha) time a few times, bowling four games in a row in an effort to improve my technique and accuracy. I've had a longtime goal of bowling 150+, but my high was around 125-130, with an average just over 100. Today being Halloween, and with my dad and brother visiting, and the kids having the day off from school, we headed out on the last day of my lucky strike card. I took one lane with four games, and the four of them took the lane next to me with two games each. My first game was lame, 87. Second one was not bad, 125. Third was okay, 111, though disappointing because I had 70 through the first five frames before falling apart. The fourth game started off pretty badly, as you can see, with 19 through the first three frames (i.e., sub-100 pace). But wow, those last 7 frames! I've never had anything close to a streak like that. I think I've had two strikes in a row before, but not 7 strikes or spares in a row. That is a cool 140 points over 7 frames, which over 10 frames would be an unthinkable (for me) 200! 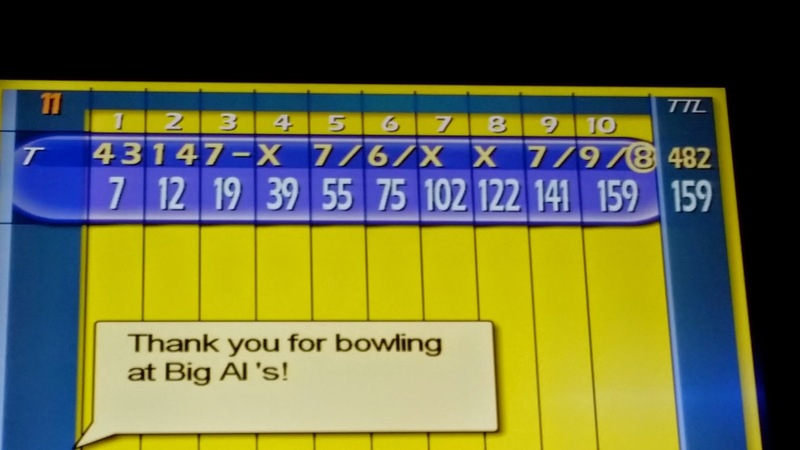 Over on the next lane, my family members were only about halfway through their second game, so I had time to bowl one or two more games, if I wanted to go back to the front desk, but I figured I'd had enough, and it was better to end on a PR than to sink back to my usual mediocrity. Embracing my inner "teenage girlness"
One of my Facebook friends commented, "When did you turn into a teenaged girl?" Ha ha ha ha! Fortunately, I am comfortable in my fortysomethingness, and I'm not embarrassed to write that I really do enjoy listening to Swift's music. However, today I'm ready to embrace my inner teenage girlness fully. I went for a threshold run this morning, and for entertainment, I was prepared to watch the end of Lara Croft: Tomb Raider, which I had leftover from yesterday's long run. For some reason, though, my Kindle Fire wouldn't stream in the gym even though it appeared to have connected to the wi-fi. I could have listened to an audiobook on my phone (I'm about 2/3 of the way through Peter F. Hamilton's space opera Judas Unchained) but on a whim I decided to shuffle through the selected songs I loaded on my phone from Red. That turned out not to be quite enough, so I moved to Sparks Fly from there. Anyway, the resulting threshold run rocked in more ways than one! I had intended on a 2-3-2/2.5 split, meaning 2 easy miles* to start, and then 3 miles at threshold pace, and then 2-2.5 miles back at an easy pace. I ended up feeling so strong that I increased my threshold pace from 7:13 to 7:08 and then to 7:03, and finished 5 miles instead of 3. My 10K PR is around a 7:12 pace, so the last three miles of this run were slightly faster, and yet I didn't feel like I was pressing; I'd categorize the effort level as a 3 on a 1-5 scale. * My easy miles are around an 8:30 pace. There is some research to the effect that for non-elite runners, music can boost running performance. I don't usually listen to music when I run, as it's mostly TV on the treadmill, or an audiobook if I'm outside (and I live in a hilly area, so it's hard to track "fast" performance outside), but Taylor Swift really seems to get me to run fast without feeling like it's too hard. Hmm, guess I need to head out to Target to pick up the deluxe edition of 1989. . . .
Am I cheating on running ... ? Thanks to one of those unexpected coincidences, I recently came across a used Concept2 Model D indoor ergometer (rowing machine) for sale on Craig's List. If you know anything about Concept2 rowers, they are very hard to find used, because they tend to get snatched up quickly. They are durable, reliable, and awesome! Rowing is my preferred cross-training exercise. I can swim enough so that I won't drown in a pool, but I don't particularly like it (even though I recognize it's a great no-impact workout). I have my bike set up on a trainer so that I can ride in the garage, but cycling is just okay for me. As I'm optimized as a runner, I don't seem to have the leg strength to drive the bike hard enough to get a good cardio workout. Of course, as a rower, I'm mediocre; the times that dedicated rowers post on Fitocracy are well beyond me. But I like that the cross-training is no-impact and an all-around body workout. So when I saw the used Concept2, I pounced on it. Some Fitocracy members gave me advice about what to check out in a used rower, and this one tested as close to new. I was so excited that when I paid for it, I actually waved it toward me and said, "Come to Daddy...."
Why do I want a rowing machine of my own when the gym has one? Well, the gym isn't open as late as I would like, and its weekend hours are even stingier. Plus, there are occasions when I can't leave the house (the very rare snow-in; more frequently, Mr. Mom duties) and would like to get in a good workout. Still, I wouldn't have felt anywhere near as excited about a used treadmill, for which I feel like I'm maybe "cheating" on running. Yeah, I know it's a silly analogy. But there are very real reasons I much prefer to have my own rowing machine than my own treadmill. I'd use a treadmill a lot more than I plan to use this rower, which means I'd need to do more frequent maintenance of the treadmill. I'd much rather leave the treadmill maintenance to the gym, and deal with the (lower) maintenance requirements of the rower. In addition, unless I'm stuck at home, or the outside weather is too foul, I can run on the roads or at the track. If I had a treadmill, I could run at home anytime I wanted to, but my cross-training options would be more limited. The question now is, do I look for a cheaper gym membership just for access to treadmills? Being able to tolerate the rain is definitely a useful life-skill for living in the Pacific Northwest. It's not that we get so much rain in absolute terms; most major East Coast cities get more inches of precipitation per year. It's the eight months of gray misty drizzle that you have to get used to. Tolerating the rain is one thing. Being thankful for it is altogether different. And yet, here I am, thankful for the rain. Fall Saturdays are quite busy in my household, with lots of soccer games for my kids. Saturday races are therefore anything but guaranteed for me, which is too bad, seeing as how fall is the prime running season. There's a Halloween-themed race that I've run every year since it began three years ago, but it looked like this year I wasn't going to be able to make it because of my kids' soccer conflicts. Boo! The race organizers very generously told me if I couldn't make it, I could run the 5K virtually, and they'd get me the race bib and medal later (most likely at the next event). Of course, it wouldn't be quite the same because race day atmosphere is so important. And then it turned out that the recent downpouring of rain we'd gotten here had left all of the local park fields waterlogged, so the parks and rec department cancelled all soccer games this weekend. As the dad to soccer-playing kids, I must expressed sadness at this turn of events. 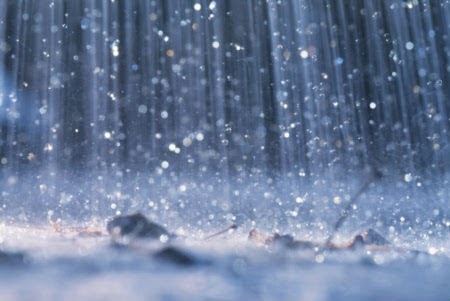 As a race-loving runner, all I can say is, "Woo hoo, thank you, rainfall!!!" Last night was the fourth episode of this season's "Once Upon a Time." Titled "The Apprentice," it continued the Frozen arc but introduced a new element drawn from "the sorcerer's apprentice" part of Fantasia. There was a walking broom complete with arms, and even a mouse! Yesterday morning, I did a hard speed session: a warm up mile, then six 1/2 mile repetitions at a 6:00 pace with 1/4 mile recovery intervals at a 12:00 pace. After a short break, I ran an easy 1/2 mile and then cranked out a sub-6:00 mile (5:57 to be exact). That was a good start to a day. My plan from then on was to go for a short (~3 mile) recovery run in the late afternoon before taking my younger son to his soccer practice. At 4:30 p.m., I left my office, ready to go for a second run of the day. However, I stopped to chat with a colleague. Damn interesting colleagues! Half an hour passed by, and there went my window for a recovery run. To make things worse, in the parking lot, I ended up chatting with another colleague for a bit. I ended up being late to taking my son to soccer! Nevertheless, it was a good reminder that while running is important, it's not supposed to be life-consuming. I would've liked to have gotten the extra 3 miles in for the day, but it's not like I hadn't accomplished anything on the training front, as the speed session - 7 miles total - was a hard, quality workout. The 3 miles would've been mostly to relax. Tim Noakes in The Lore of Running said something to the effect of making sure that you don't neglect friends and family for running. Good advice to keep in mind. I was very eager to watch the premiere of ABC's new law school/legal drama "How to Get Away With Murder," although I waited until after two episodes had aired before getting around to it. It's from the producers of "Scandal," which has managed to walk the fine line between ridiculousness and entertainment, so that was a point in its favor. In addition, I had once proposed to a law school colleague that we should create a pitch for a TV show that would be like "Beverly Hills 90210" set in law school; I figured this would be similar. The season 4 premiere episode of "Once Upon a Time" set Elsa (from Frozen) as the seeming antagonist for the current arc, with her determined to find younger sister Anna in Storybrooke. How did the storyline advance in episode 2? I ran a very hilly 10K race this past weekend and finished fourth overall (first among Masters runners) out of 86, which doesn't sound too bad. Because this was a hand-timed race, not a chip-timed one, I didn't know how close I was to the top when I left. In fact, I missed the awards ceremony, which is a shame because I was the #3 male. Anyway, when I finally saw the results posted on-line a day later, I learned not only that I was #4, but that I was just 79 seconds behind the winner. 79 seconds in a 10K isn't particularly close (about 13 seconds per mile), but it's not that far off either. This was a race where I led for the first mile or so before giving up the lead. However, I was generally better going uphill than my peers (though worse going downhill), so I had some advantage on the hilly course. The biggest mental obstacle, though, was that I lollygagged miles 5 and 6. Because it was such a hilly course, a 10K PR was not even remotely plausible. (I had run this area in a race once before and noticed that everyone seemed to be about 30 seconds/mile slower than normal.) With no PR in sight, I just didn't feel like subjecting myself to more discomfort, particularly when I seemed to be able to keep my relative position in the race at the end. Egad! Cutting 79 seconds off a 10K normally wouldn't be that easy to do, because presumably you're running at your max pace, and 13 seconds/mile is far from trivial. But miles 5 and 6 jump out. Sure, mile 5 was pretty steep, but I'm sure 20-30 seconds could've come off there. And mile 6 . . . argh. I enjoyed this race, but now I have regrets about not pushing myself more, and taking it easy just because no PR was in reach.